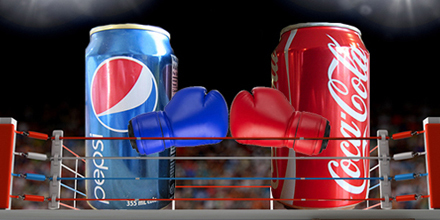 Is a Public Brand Rivalry an Effective Marketing Tool? – Kent Huffman: Marketing. Branding. Strategy. Tactics. Results. Is a Public Brand Rivalry an Effective Marketing Tool? Do comparative branding campaigns ever work? And how do B2C and B2B brand rivalries differ—or do they? Just about any successful salesperson will tell you that the best way to motivate a buyer is to keep the conversation focused on the positive aspects of your own product or service. Openly criticizing competitors takes the message in a negative direction that may turn the prospect off while eroding your credibility and forcing you to conclusively prove poor performance by others. First, you incite an intense desire for your competitor to find fault with you, which they can probably do—especially since its marketing and sales teams will be more determined to do so than ever. Second, you could wake a sleeping giant that is now intent on doing everything possible to protect its customers and take yours. Third, you identify competitor deficiencies your competitor may correct rapidly or totally eliminate so you no longer have an advantage. And, fourth, what if the competitor you’re selling against isn’t the one your prospect uses or is interested in? This same logic extends to advertising and branding campaigns. It’s a good policy to arm your sales and marketing teams with differentiators that set your organization and offerings apart from the crowd. With this information as background, it’s easier to tailor messages that play up your strengths, and if your competitors are lacking in those areas, that resonates particularly well in the marketplace. In personal selling situations, your sales team can especially play up comparative differentiators if they get prospects to indicate what they are using now. Do Comparative Branding Campaigns Ever Work? Yes, they certainly can. Perhaps the longest-running and most well-known comparative B2C branding story is the Pepsi Challenge, indicating blindfolded consumers overwhelmingly preferred the taste of Pepsi over Coke. However, this was largely a one-way campaign from the underdog’s perspective that wasn’t overly credible. If Pepsi tasted so much better, then why did Coke continue to dominate the marketplace? Another example of a competitor taking on the lead horse was when Avis openly indicated they were #2 to Hertz, but that motivated Avis to “Try Harder.” Although that tagline helped Avis succeed in the short term, the company is now in third place in the car rental industry. After 50 years, Avis dropped that slogan in 2012. These types of iconic B2C brand challenges were most prevalent in the 1980s and 1990s when advertisers could reach most of the population using the three major television networks. With the massive media mix today, it’s far more difficult to gain widespread exposure to all target audiences and carry that type of two-step message (that we are better than so-and-so and should therefore be your brand of choice). Brand rivalry in B2B marketing is not usually as public as consumer branding competition. In the B2B marketplace, decisions are usually motivated by business drivers that include profitability and performance. To earn business contracts, you need to prove domain expertise and a history of success built on long-term relationships. Since B2B marketers often have to beat out competitors on both tangible and nontangible factors, it’s best to learn as much as possible about others in your space and be prepared to play up what sets you apart across the board, especially in areas where others may be less proficient. However, to scream out loud why you are better seldom proves the professionalism potential business partners are seeking. Identify what your target market needs and wants, then fill the gap. Articulate the benefits of your organizational culture as it relates to how that enables you to better serve customers. Look for satisfied customers and use their experiences to build testimonials and references—and to serve as a guide to determine what people expect you to deliver. If you really do have a unique product or service, use every possible strategy to get people to try it for themselves so you build repeat customers. Finally, seek and publicize industry awards that demonstrate how you provide solid and desirable products or services.